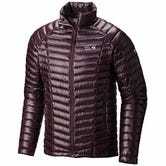 The Mountain Hardwear Ghost Whisperer Collection (Amazon/Mountain Hardwear) is in a league of its own when it comes to warmth-to-weight ratio. While the Ghost Whisperer’s low profile makes it amazing for layering, it managed to be my only piece of outerwear for my October trip to Stockholm. It’s also downproof, windproof, water repellant, and packs down into its own pocket. Weighing in at just 7 oz, it has to be worn to be believed, and at that point you’ll never want to take it off. Critically, the Ghost Whisperer also won’t instantly overheat you when you enter a restaurant or sit down in an Uber. Can The World&apos;s Lightest Down Jacket Stand Up To Backcountry Abuse? We’ll be covering their excellent new StretchDown shortly, stay tuned.